This skirt makes me look a little hippy. And pregnant. I do not care! Our love is pure. We will be together for always. Or until it falls apart. Whichever comes first. Also, I swear my posture isn't this bad. Maybe. Probably. I just get kind of awkward when Aaron is behind the camera these days. I need to tell him to remind me to stand up straight. Stinky's reaction to this outfit was, "MA! I wike your cwothes! I WOVE your cwothes!" And this is why I keep him around. You do not look pregnant by any means! You look great! And your hair is so pretty like that! I love this skirt! AND TRUST...you do not look pregnant!!! The color of the top is a great addition. Cute outfit! Love how you can wear a dress as a top! I plan on trying that today as well! I don't think you pregnant, but I understand feeling that way - I'm pretty sure most of the time I do look pregnant! P.S. Your hair also looks great! 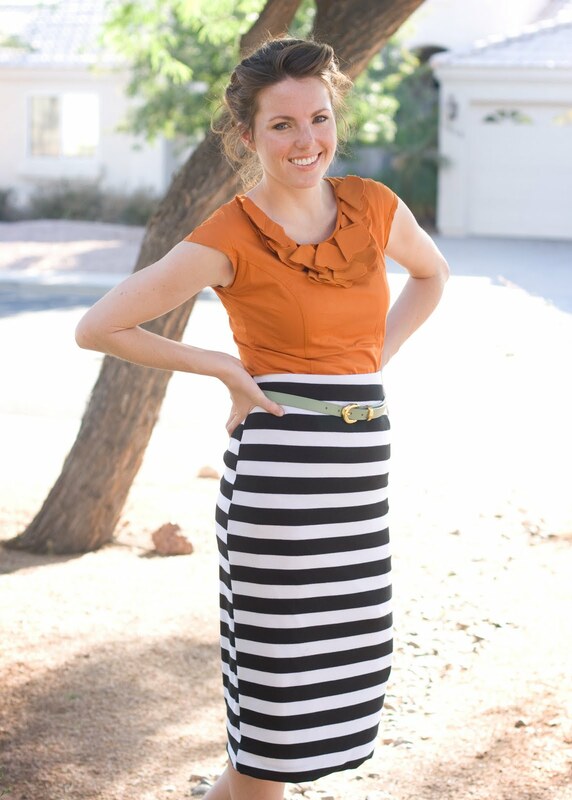 way to rock the stripe skirt again! And very clever to use the dress as a top. I keep trying that and I just can't manage to make it look as good as you! PS- manawilies was so crowded! Def not like when I went before. love the stripes!! so cute! Looking gooood! My kid never tells me he likes things, it's the exact opposite. And he's always asking if we can go to the hospital tomorrow to have the baby come out. I am definitely NOT pregnant. And I'm a size 2. He knows how to make a girl feel good. What a little punk! That color combination is amazing! The orange and black and white is beautiful and then I adore the little bit of green mixed in! Genius! Also, your updo is so pretty! Sorry for following and never commenting, I'll make it up to you right now. Um I love your outfit, but can I please say something about that hair? It is AMAZING! My goodness! I love how you didn't even note how beautiful it was. Like, "oh this old hair, yea I guess it's okay." I wasn't totally in love with the striped skirt trend before, but this outfit looks pretty fantastic, and totally non-pregnant. Also, I love your little Stinky. It's criminal that the last time I saw him in person he couldn't even sit up on his own...and now he's doling out fashion advice? Sigh. Where does the time go? Yes, the outfit is fabulous, and I adore the stripes. But can we talk about your lovely hair?!? It looks like the perfect thing for a hot summer! Pics of the back? Tutorial? Yes, please! I love that skirt! And you do not look pregnant! ummmmm. Our stomachs don't even KIND of resemble each other at the moment....no preg. and I don't really know what Pinterest is but if I did I think I would probably pin these photos...if that makes sense. Love this outfit. maybe the most of all the blogging outfits. I think I need that skirt. Loving the color combo going on here. You look way to pretty and fancy pants to be in AZ. That kind of outfit needs to be in NY. Make it happen, cap'n. really love this outfit. and your hair. maybe i give those same two compliments to you alot, but they're true. also, nope. don't look pregnant at all, skinny. Love the outfit! And yeah right (!) on looking pregnant. the hint of green is to die for. makes the outfit! I "wove" it! Oooh! Love the new blog design! and your hair looks adorable here! I love this look! 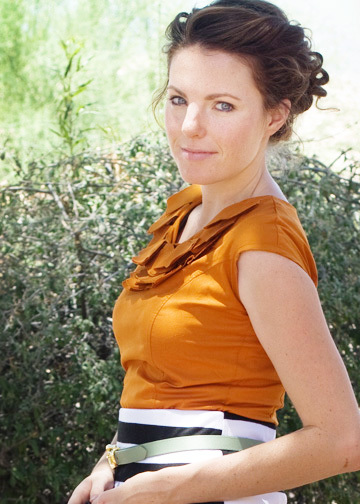 The color of the top (dress) is beautiful with the striped midi skirt. I seriously thought that this was a catalog shot from Shabby Apple. You are STUNNING!! LOVE the "skirt" Fabulous! I love your outfit! I would have never thought to put this together, but you make it look amazing! love this idea! and i love that you pared it with an orange top! I LOVE this outfit! and i have that same dress! I loove it. Did you cut the dress to make the shirt? or wear the whole dress underneath a skirt? You look wonderful!